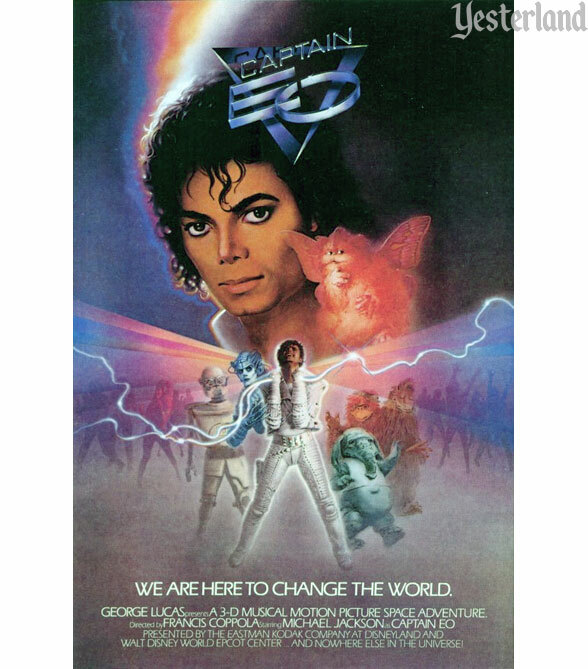 Experience the singing, dancing, and song-writing talents of Michael Jackson as Captain EO—on a quest to change the world. It’s a spectacular, 70-millimeter, 3D space adventure. You might have to wait a while. There’s only one theater, and it only has around 500 seats. The show lasts 17 minutes, and it takes several minutes to reload the audience between shows. It’s worth the wait if you’re a Michael Jackson fan… or if you’re a special effects fan. There are 150 special effects in the film, and a bunch of in-theater effects too. 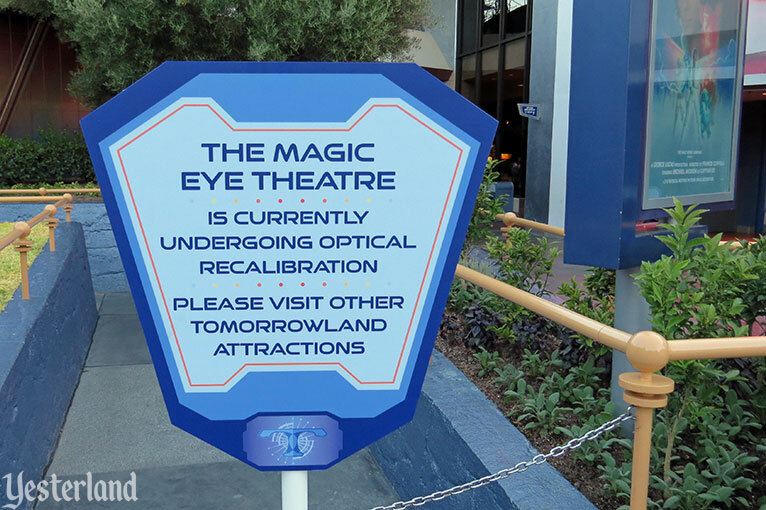 Pick up your 3D glasses as you enter the Magic Eye Theater… but please don’t put them on until you’re seated. The doors open. Please move all the way to the end of a row and take a seat. You may put on your 3D glasses now. (If you wear eyeglasses, don’t worry; the 3D glasses fit right over them.) If you don’t like really loud music and noises, this also might be a good time to put some cotton in your ears. 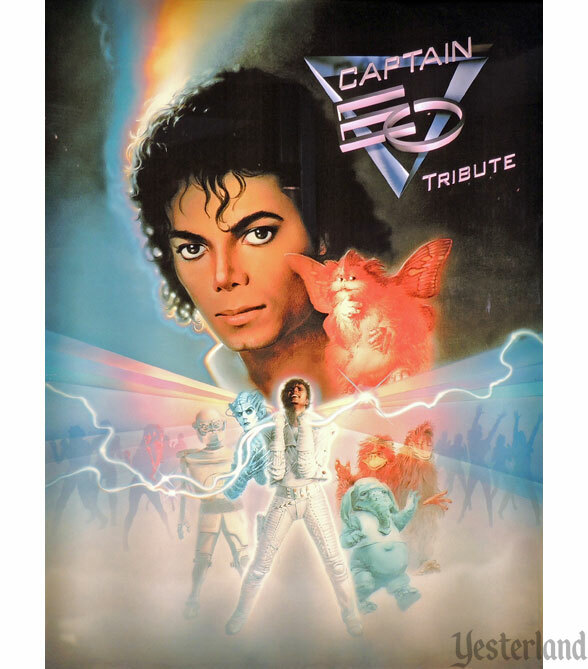 Sit back and watch Captain EO and his faithful, if unusual, crew—Hooter, Fuzzball, the Geex, Major Domo, and Minor Domo—as they prepare to land their little spaceship on an oppressed planet. Where’s the landing beacon? Don’t trip any alarms… Oops. The crew tripped the alarm. Oh no! There’s an enemy patrol ship. Still no landing beacon? How about a map? Hooter ate the map? Crash! Too late—but there’s the landing beacon. Oh, oh… Captain EO and his crew have been captured, taken to the wicked Supreme Leader (played by Anjelica Huston), and sentenced. “Justice” is swift and severe. Captain EO accepts his sentence, one hundred years of torture, with grace. He tells the Supreme Leader that he has brought her a gift, which she will see—and hear. Captain EO just proved that music causes good to triumph over evil! As you exit, please drop your 3D glasses in the receptacle. It was 1984. Michael Jackson was at the height of his career. His 1982 album Thriller, already the best-selling album of all time, was still on the charts. In 1983, Jackson had debuted the moonwalk. His 1984 “Victory” tour played to sold-out stadiums. Michael Jackson wasn’t just a pop star. He was a cultural phenomenon. Also in 1984, movie executives Michael Eisner and Frank Wells took over the top jobs at Disney. In addition to launching an aggressive slate of movie projects, Eisner and Wells sought to invigorate Disney’s theme parks. They brought their movie experience to the parks too. 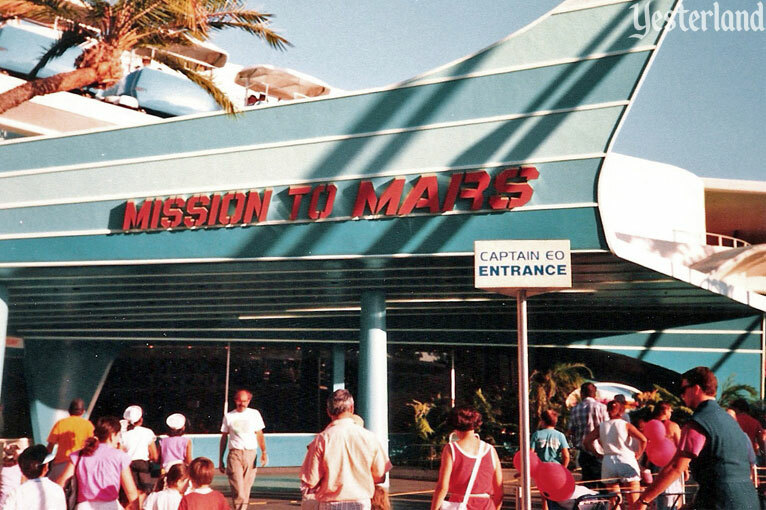 Traditionally, theme park attractions didn’t rely on star performers. That would now change. The third idea we came up with for Disneyland was to create something with Michael Jackson, who appealed to teenagers, but also to young kids, and even their parents. Jackson was a huge fan of our parks, sometimes visiting several times a month, in and out of disguise. Our notion was to put him in an extended 3D music video. George Lucas happened to be one of Jackson’s heroes, and provided another lure. Ultimately, Lucas decided to produce the video and recruited Francis Ford Coppola to direct. The result of this collaboration was Captain EO, which opened at Disneyland on September 18, 1986 (six days after it opened at EPCOT Center). 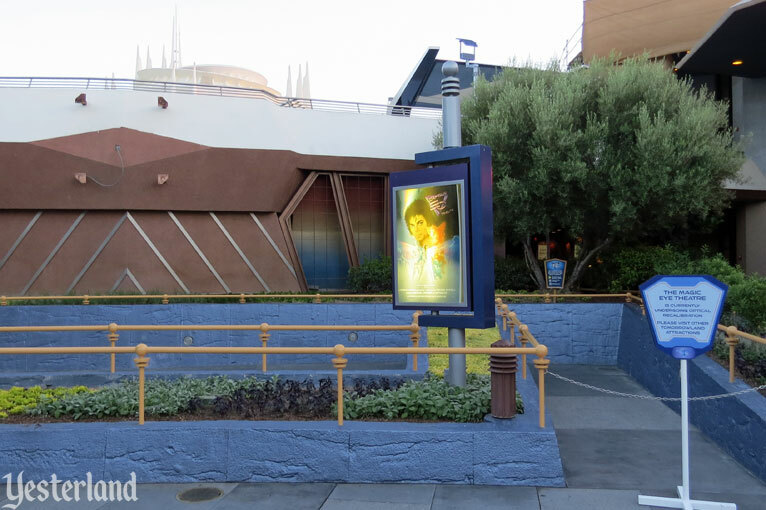 At Disneyland, a new theater for Captain EO would replace the Space Stage. 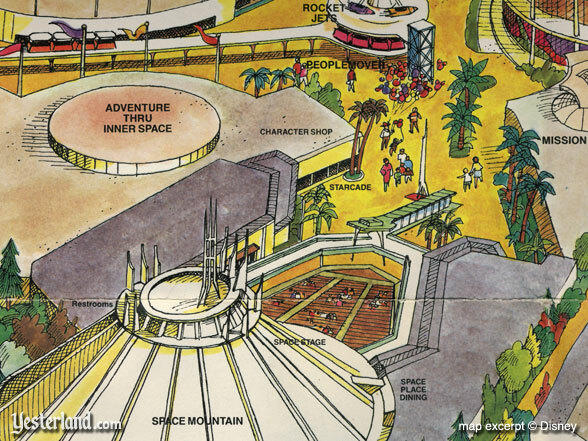 1983: Space Stage was an outdoor theater. 1987: How many differences can you find? 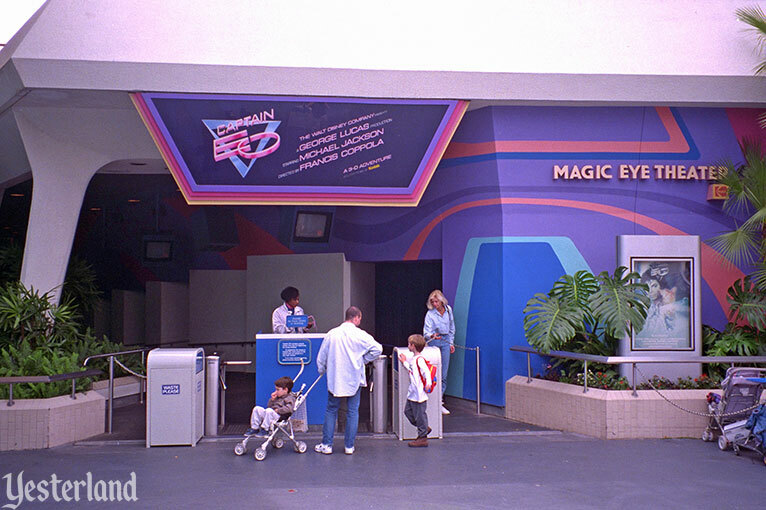 Although built for Captain EO, Disneyland’s Magic Eye Theater opened in May 1986 with the delightful Magic Journeys, the original 3D movie from Epcot’s Imagination pavilion. 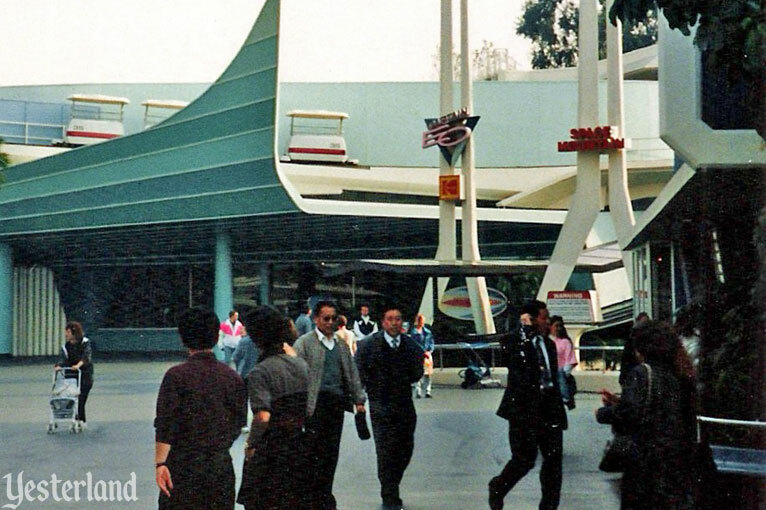 Actually, Magic Journeys was no stranger to Disneyland’s Tomorrowland, having enjoyed a previous run at the outdoor Space Stage. 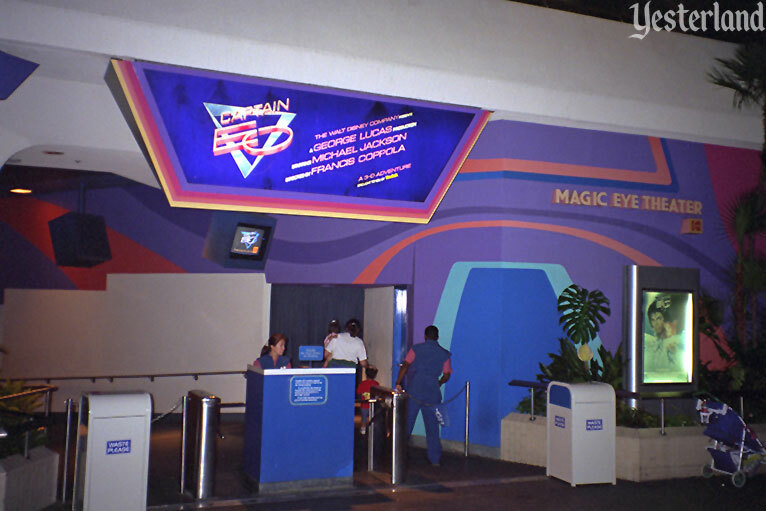 In September of the same year, Captain EO moved into the Magic Eye Theater. 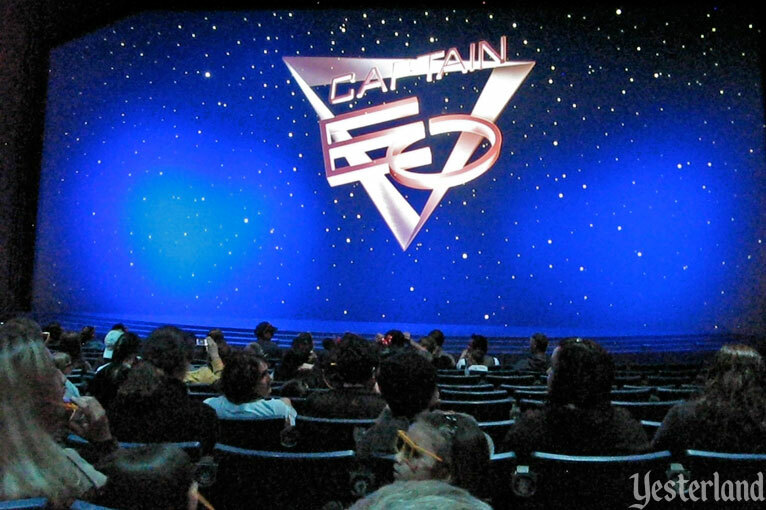 Most guests reacted favorably to Captain EO. A few newspaper articles were more critical. For all its wondrous imagery, “Captain EO” is nothing more than the most elaborate rock video in history, like a hollow chocolate Easter bunny, it’s a glorious surface over a void. No one expects an amusement-park diversion to be “Gone With the Wind,” but given that list of credits and the film’s lavish budget (rumored to be between $16 million-$20 million, although Disney refuses to release any figures), audiences have a right to expect more than empty flash. The movie thrusts its characters into danger immediately. They are flying into your face, lasers blasting, just as you learn their names. Within such a short time you can’t empathize with their plight. But the novelty of the 3D effect is enough to occupy you through the start, though the plot is overcomplicated for the time available. Over the years, the crowds disappeared. Movie-based attractions tend to have less repeat appeal than rides. Michael Jackson’s star shined less brightly. 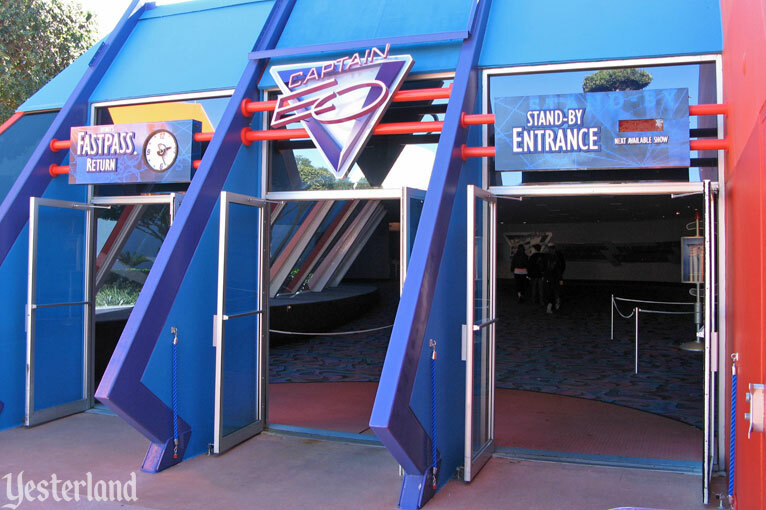 After a run of over ten years at Disneyland, Captain EO closed quietly in April 1997. 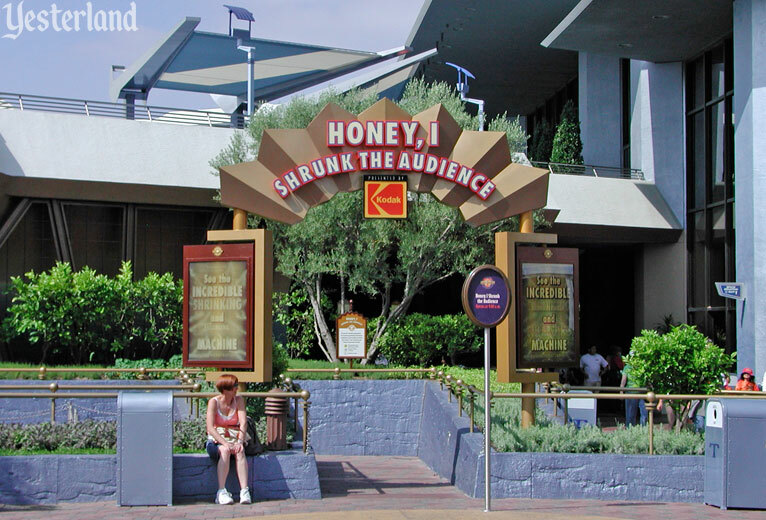 In May 1998, the former Magic Eye Theater became the West Coast home of the 3D movie Honey, I Shrunk the Audience, which had already replaced Captain EO at Epcot in 1994. 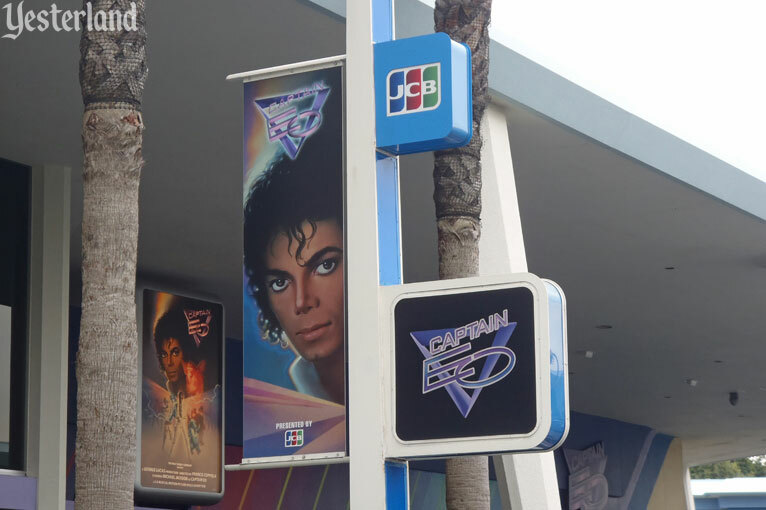 At one time, Captain EO was showing at Disney parks in California, Florida, Japan, and France. The final place at which you could see Captain EO was at CinéMagique, presented by Kodak, in Discoveryland at Disneyland Paris. In late summer 1998, the Captain departed from Paris as well. For more than ten years, Captain EO was just a memory. Michael Jackson died on June 25, 2009, at age 50. In the years leading up to his death, Jackson had been in the news for his behavior in public and allegations of what he might have done in private. But after his death, there was a renewed interest in his music. The King of Pop left behind an extensive catalog of Jackson 5 albums, solo albums, and compilations. His CD and music download sales soared. Apple’s iTunes named Michael Jackson the 2009 Artist of the Year. 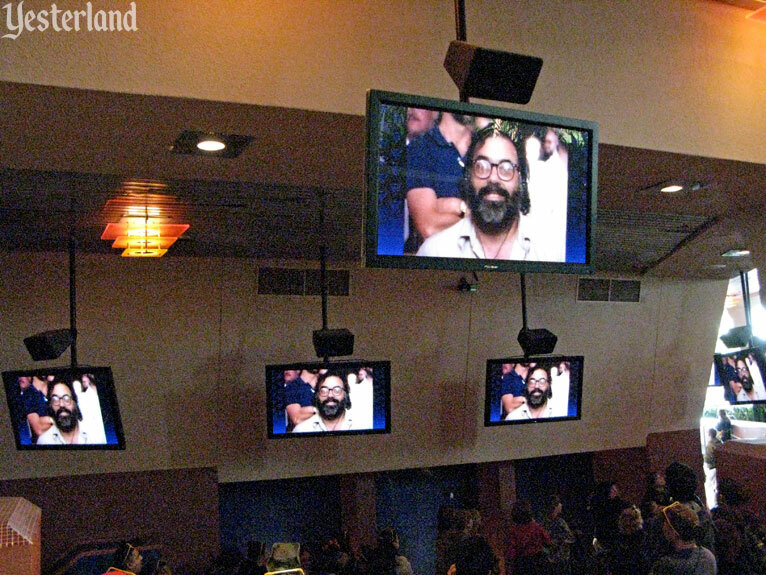 Meanwhile, at Disneyland in 2009, Honey, I Shrunk the Audience had trouble filling seats, even on busy days. After it had played more than a decade in the Magic Eye Theater, few Disneyland guests were eager to see the aging 3D film based on Honey, I Shrunk the Kids, a largely forgotten movie from 1989. This disparity of popularity was not lost on Disneyland management. In September 2009, the Magic Eye Theater was temporarily closed to the public for several days. Officially, the reason was to show Captain EO to Michael Jackson’s children. 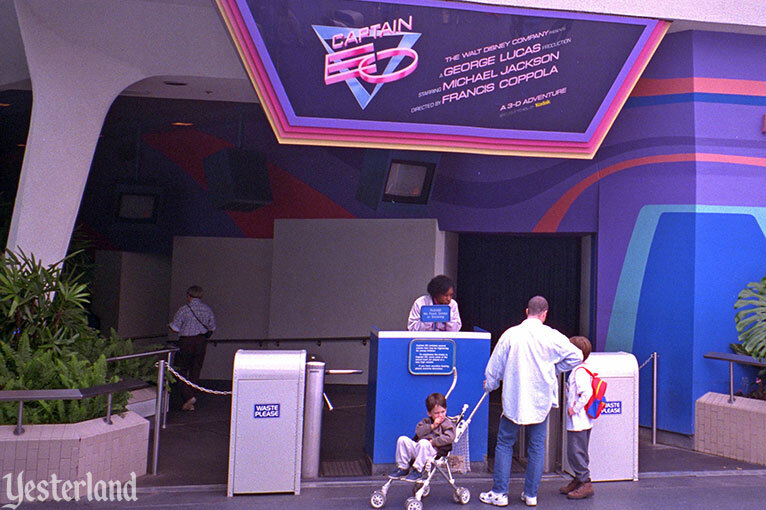 But it was also an opportunity to test the feasibility of bringing back Captain EO for a public run. 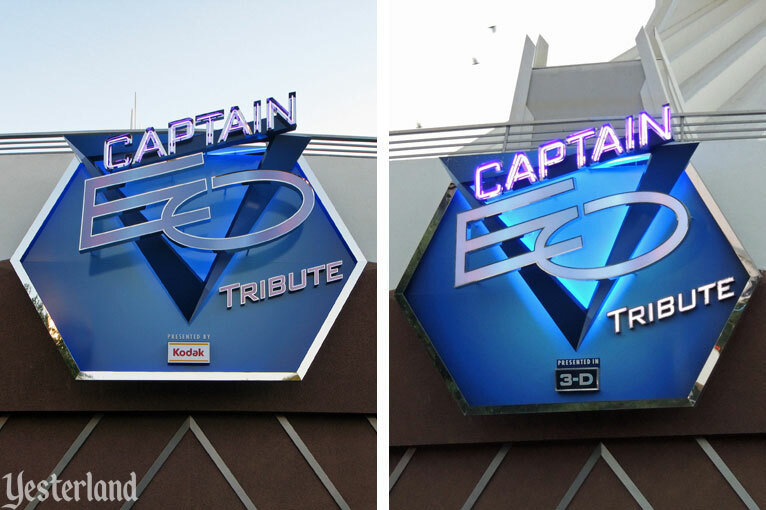 Captain EO reopened at Disneyland on February 23, 2010. Well, technically Captain EO did not come back to Disneyland. 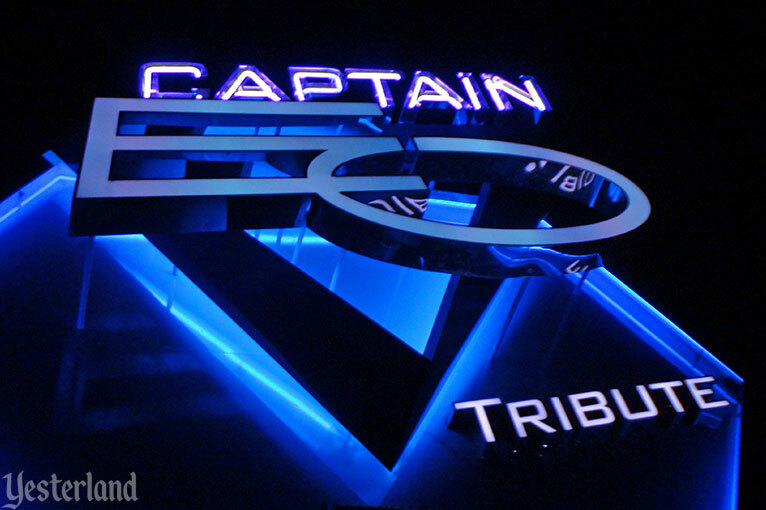 The 2010 version of the attraction was called Captain EO Tribute. 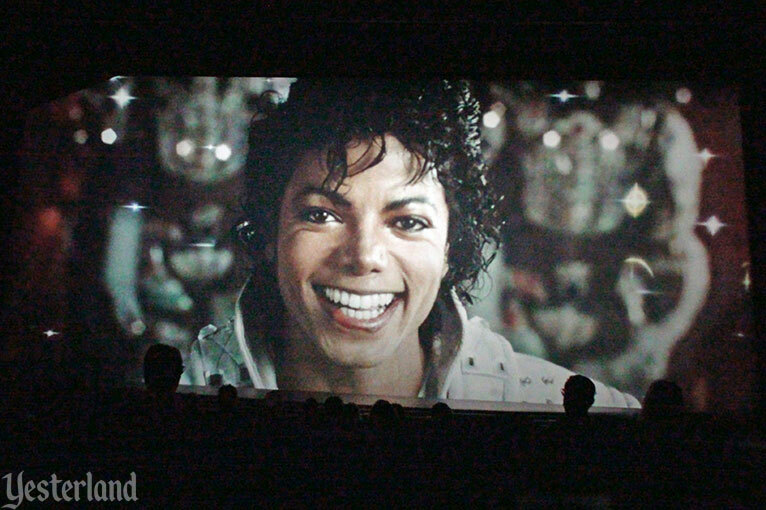 Part of the tribute at Captain EO Tribute was a new pre-show with flat screens showing footage from a TV documentary, The Making of Captain EO (1986). It was the same movie in the same theater. The 3D technology and special effects of Captain EO had been state-of-the-art in the 1980s, but looked dated when the show returned. Audiences of 2010 were accustomed to digital 3D at their local cinemas and complex CGI wizardry, such as in James Cameron’s Avatar. In comparison, Captain EO was downright old-fashioned. For Honey, I Shrunk the Audience, the Imagineers removed the lasers, smoke devices, and fiber-optic starfield—the major in-theater effects from the original run of Captain EO. They installed new in-theater effects, including a mechanism to allow the theater floor (and the seats attached to it) to drop and bounce. 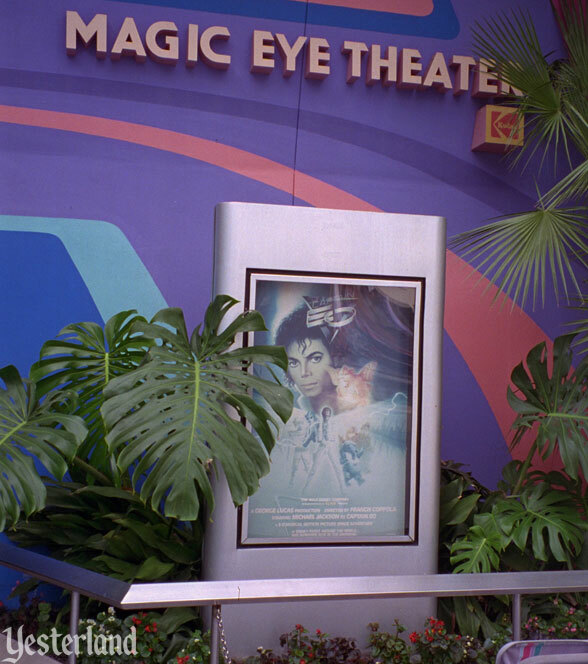 For Captain EO Tribute, the budget did not include bringing back the old effects, but the “new” effects were matched to the show. What really mattered was Michael Jackson’s music and his performance. The audiences of 2010 could again see Michael Jackson at his best. And it was still 17 minutes of fun entertainment. 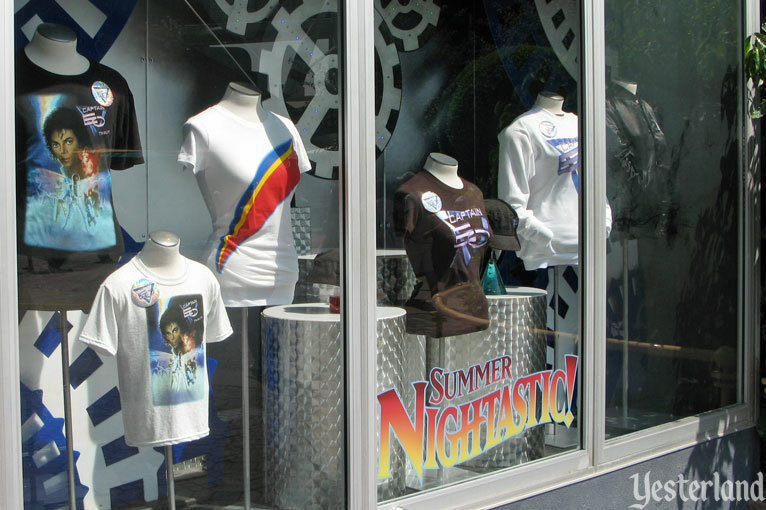 Star Trader next door capitalized on the renewed interest in Michael Jackson and nostalgia for Captain EO. Disneyland’s “exclusive, limited engagement” turned out not to be so exclusive. Captain EO reopened at Disneyland Paris on June 12, 2010; at Tokyo Disneyland on July 1, 2010; and at Epcot on July 2, 2010—without “Tribute” tacked onto the movie’s name. The limited engagement also turned out not to be so limited. At Disneyland, it lasted more than four years before quietly ending June 18, 2014. The sign came down the next day. A few days later, on June 30, 2014, it was sayonara at Tokyo Disneyland. Then, on April 12, 2015, it was au revoir at Disneyland Paris. The last place to watch Captain EO was at Epcot, where it was good bye on December 6, 2015. 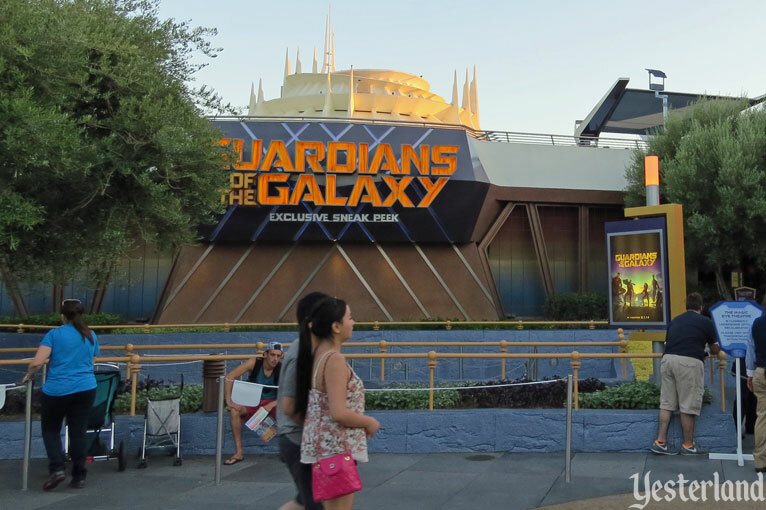 Renamed the Tomorrowland Theater, the theater showed more movie sneak peeks—Big Hero 6 (2014), Tomorrowland (2015)—and Star Wars: Path of the Jedi, a 10-minute distillation of the first six Star Wars movies. Or it sat idle. 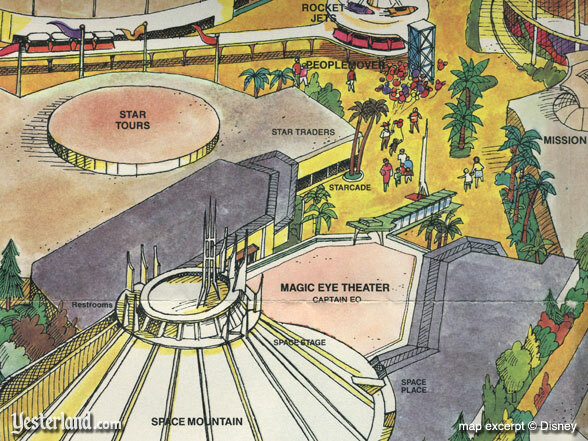 Sure, Captain EO could still “return at a later date” to Disneyland, but nobody still expects this to happen. Then again, nobody expected Captain EO to return in 2010. Now, please continue to Captain EO at Epcot from 2010 to 2015, and what replaced it (updated Yesterland article, originally published in 2015).